Dorothy Emeline Tate was born June 2, 1911 in Alix, Alberta. She began her education in Edmonton and later attended school in Vancouver when her family moved there in 1922. She graduated from the Vancouver General Hospital School of Nursing in 1932 and received her nursing degree from the University of British Columbia in 1933. The following year, she gained experience in tuberculosis nursing at the Vancouver General Hospital and at a tuberculosis clinic. She began her public health nursing career as a public health nurse with the Saanich Health Unit on Vancouver Island. In 1943, she obtained a master’s degree in Administration in Public Health from Columbia University. She then spent a year as nursing consultant with the Provincial Health Department. 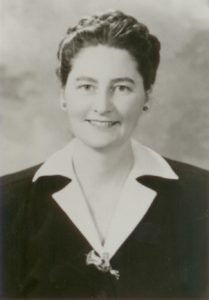 In 1944, she was appointed director of public health nursing and worked to implement a uniform salary schedule for all provincial health nurses, a standard uniform for staff, policy manuals of approved written procedures and a simplified record system. The tuberculosis manual she instituted was the first major manual of its kind, and was followed by an “information kit” that provided public health nurses with an up-to-date guide on venereal diseases. She resigned in 1948 when she married Walter Slaughter, and moved to Saudi Arabia for four years. Upon her return to Vancouver, Dorothy Slaughter returned to a staff position at the Boundary Health Unit, Surrey. In 1955, she was appointed consultant and regional supervisor, Division of Public Health Nursing. In this position, she visited health units and public health nursing staff throughout the province. Dorothy Slaughter was active in RNABC, serving as chair of a committee struck to develop a booklet on the Association. She co-chaired the RNABC Committee on Public Relations from 1958-1961, and chaired this committee from 1962-63. In 1962, Dorothy Slaughter was invested as a Sister in the Order of St. John’s Ambulance by then Governor General Georges Vanier. She retired in 1976, but remained active in many community groups, such as Soroptomists International, University Women’s Club of White Rock, Red Cross, Elizabeth Foundation of White Rock and the White Rock Historical Society. She died in White Rock October 9, 1993, age 82. Records include correspondence, letters of acceptance, enrolment lists, diplomas, and transcripts relating to her education. Correspondence also relates to her nursing career, with an invitation and published material relating to investiture in the Order of St. John. Photographs also chronicle her education and career, with an interview by Nora Whyte on a cassette tape. A collection of artifacts includes crests and a badge from the BC Public Health Service, a graduation hood, and two silver trays with an inscription from the Division of Public Health Nursing.